A basic rectangular form on flat ground with a ground floor entered from the short gable end and a hay loft on the second floor above. 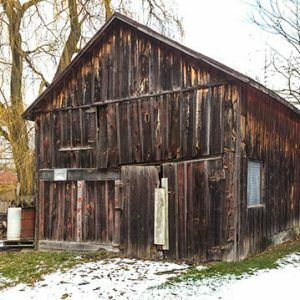 This is derivative of one of the earliest forms of barn, which long ago were house-barns with the dwelling at one end and the barn the other. A basic rectangular form entered at grade from the long side with a hay loft at a second loft floor above. The ground floor is often, but not always, of heavy stone walls and the upper floor in timber framing. Generally, the roof has a single pitch at a modest angle with a single ridge. 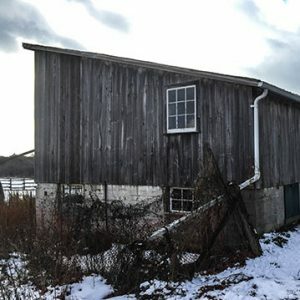 These barns have a long tradition of using sloping terrain with or without a ramp to allow direct access to the hay loft at the second floor and sometimes include granary bins, generally framed in wood with wood plank siding. The upper floor was often in three parts. A central loading floor/ threshing floor had large hay lofts to either side. The opposite lower side has direct access to the ground floor generally with thick stone masonry walls, which enclose pens and stalls for the animals and related rooms, sometimes a small dairy. 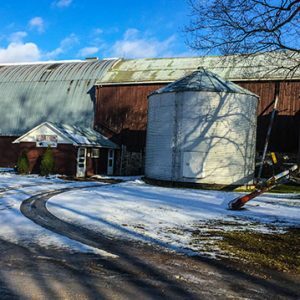 Like a bank barn, these barns use topography and or ramps to directly access the second floor hay loft and on the opposite long side have entrances to the stalls and pens of the ground floor. Often, this version of a bank barn has a jettied second floor over the ground floor entrances, which provides a sheltered forebay. Where possible, the ground floor entrance-jettied floor side faced south protected from cold north winds. This is one of the most popular framing methods for barn roofs to increase the interior capacity of the loft. This is achieved by creating two slopes: a more shallow upper slope and a steeper side slope with a top ridge and two secondary ridges at the change in slope. Traditionally, heavy timber framing was used for this or later by trussing the roof framing. 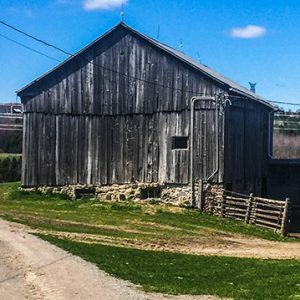 The lower barn may be a traditional English or bank barn arrangement. A small “barn” with a single slope shed roof suitable for various uses, such as a stable, piggery or a drive shed for implements. These may be single storey or two stories with accommodation for animals below and a small hay loft or mow above. Their size is limited by the span of the single span roof rafters. 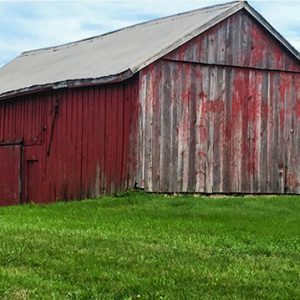 The classic English rectangular barn form exists in many sizes. Small barn-like sheds were often purpose-built as drive sheds/stables particularly prior to the advent of motorized transport. 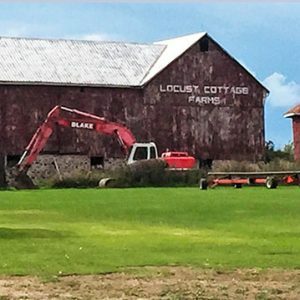 They also served as implement sheds, piggeries, sheep barns, wood sheds, ice houses, chicken houses and so on. Many of these have survived and been converted to garages in today’s world. 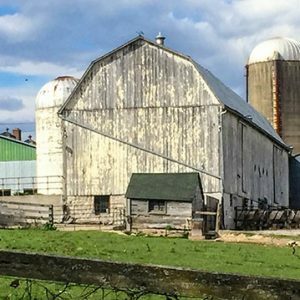 Often the initial basic barn would be added to for extra capacity adding wings, which changed the plan of the initial barn into a H,X,T or L plan or the barn may have been designed for extra capacity for specific purpose. 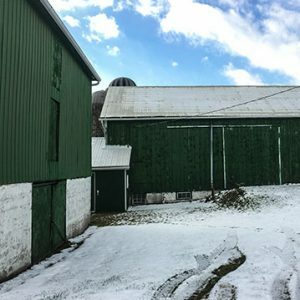 Depending on the scale of the farm operation, these barn complexes can be quite large with specialty functions in various sections of the complex related to farm operations (hay, various grains, corn) and animals (cattle, sheep, pigs, etc.) involved. Further, depending on when various additions were created they might reflect English, Dutch, shed, gambrel or bowstring truss forms. Various projections are often added to barn design. These may include mid-gables, dormers, ventilation cupolas and, of course, the ubiquitous silo. Some of these added features such as gables and dormers admitted daylight to the interior. Other features such a cupolas promoted ventilation. Ventilation of barn lofts and mows is critical to exhaust the potential build up of methane gas produced by drying or decomposing grasses. Silos are generally for the storage of corn, an important ingredient in animal feed. Like grasses, corn can exhaust considerable amounts of methane as it drys and is better stored separately. The tower form also aides in the flow of corn out of the “hopper” for use.